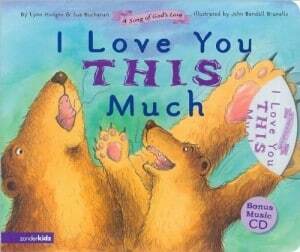 I Love You This Much is a delightful book for children. I immediately fell in love with this book. I absolutely love this book. It rhymes and has short, clear, concise text that make this book great for toddlers and young readers, but also (in my opinion) for infants on up. In fact, this book was ideal for my (almost) two-year-old niece. It’s engaging and will keep their attention, because it’s short and incredibly sweet. I also like that it could serve as a literary introduction to God. Its message is simple, important, and very comforting. I Love You This Much is a wonderful choice for any child on your gift list. I love you this much, that tagline reminds me of one ads in local tv. Sounds like a great addition to the library. We say that “I love you this much” around here a whole lot.